With our magic crystal ball, we can see why you feel the way you do. You haven’t found relief from your chiropractor, physical therapist, orthopedic doctor, massage therapist or any other provider. Your friends and family want you to try this or that. You don’t want another opinion. You want to be fixed! At Barefoot Rehab, we fix you by giving you the facts of your pain. Fully. Completely. We don’t use technology, machines, or gimmicks (notice the simple pencil ruler in the picture above). If you want a quick fix in a magic pill, we can’t help you. Temporary relief is a dime a dozen. If you want permanent relief, you’re in the right place. We get results that last. Isn’t it time to get the truth instead of another opinion? Let’s be honest. You don’t trust anyone in healthcare. You’ve failed enough times that you’ve lost almost all hope. We get it. In our practice, we don’t fix everyone. 100% success with our patients is not possible. However, if we aren’t giving you relief, there’s a reason for it. Our goal is to communicate where you are on the pain path in real-time. Instead of doing 3 months of care for 24 visits spending thousands of dollars, imagine knowing in 3 visits that you need an MRI. Or that you have a diet issue. You regain trust and hope when someone tells you the truth. Mother Nature doesn’t lie. Neither do the doctors at Barefoot Rehab. If your previous doctors had correctly identified the problem, you wouldn’t be reading this. You’d be pain-free, doing what you love. You probably agree with the following statement, “There’s something they missed.” It’s the most common problem, causing lots of pain, that no one’s talking about, and is very easily fixable. You have never heard of it before. It causes you to be tight (like in the ankle above) and in stubborn pain that just won’t go away. 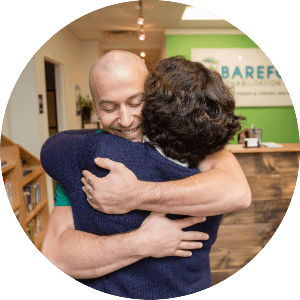 At Barefoot Rehab, we specialize in fixing this secret problem for people who have been to multiple healthcare professionals without success.